In union with our Mother Community in Vietnam, this year marks the celebration of 63 years of Father Bernard Maria Bui Khai Hoan's acceptance to guide and take care of our community from the beginning. 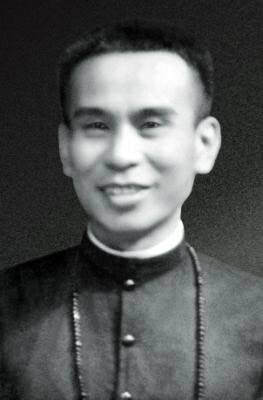 Father Bernard Maria Bui Khai Hoan acted on God's grace to establish the beautiful Charism of the Evangelical Spiritual Childhood, of becoming the infant Jesus asleep in Mary's arms. The following reflection letter was written by Sister Marta Tran, CMRM on her brief encounter with Father Bernard. Although brief, it has left a resounding impact on her life as a religious in our Community! This is my first time writing a letter to you, even though I know that I won't get a reply from you. During my first years with the Sisters of Mary Queen of Mercy, I learned about you through the Sisters in the community who shared their personal experiences with you, especially on your cheerfulness and hospitality towards the poor. Through these stories, I wished that someday I will be able to go to Vietnam to learn these influences from you. My desire to go to Vietnam deepened when I was able to listen to your spiritual teachings on audio tapes and CD's. However, God had another plan. Before I entered the Novitiate in 2005, your health was declining. At that time, we lived near Pius X High School, and a Sister had contacted you over the phone to ask about your health. I had the privilege to converse with you and I remembered asking you a question. I asked you to pray for me, and you said, "Yes." Your "yes" was a clear and strong voice that left an imprint on my heart. Whenever I was faced with temptations or was feeling down, or even when I was in doubt of God’s mercy, your "yes" echoed in my mind and heart. You assured me: "Do not be disappointed, I will pray for you,” and I thought to myself, you said “yes” when you were alive, but now you are in eternal happiness with God, you will not forget to pray for me in God’s sight. You are also our Founder and have been an instrument that God used to carry out His will, so your prayers are very effective, and "peace" has returned to my soul. The short conversation that we had on the phone that night has left a deep impact on my heart that I did not realize until storms struck in my life. Your "yes" is my comfort and is the most precious farewell word for me before you left us. Even though we have never physically met, we will surely meet again one day in eternity.